Chronic, long-term gum disease can lead to the loss of your teeth. If you stop smoking completely, then you may be a candidate for dental implants to replace these missing teeth. However, implants can fail if smoking continues or you resume. Smoking causes peri-implantitis, inflammation of the gum tissue surrounding the implants that will then cause bone loss and implant failure. Step One: Stop Smoking! If you smoke, the best thing you can do for you and your family is to stop. 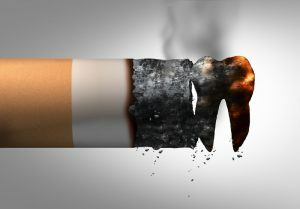 If you continue to smoke, fixes to your dental problems will not last. Damage to teeth and gums will continue and counter-act whatever you have done. Treating Gum Disease: Smoking increases your risk of gum disease, a type of periodontal infection caused by the bacteria in plaque. In its early (and easy-to-treat) stage, gums will swell, become red, and bleed easily. Treating gum disease requires a deep cleaning procedure to remove the tartar and bacteria from below your gum line. This type of procedure is also called scaling and root planing. Sometimes this requires your dentist to use a laser to remove bacteria and prescribe antibiotics to help control bacteria growth. Dental Implants: When teeth fall out, they should be replaced. Not only are missing teeth unattractive but can also lead to spacing issues and uneven wear in nearby teeth. Dental implants can restore your smile. Because dental implants require surgery, you must be in good health, have healthy gums, have adequate bone to support the implant. Smoking can affect previous dental implants with loosening due to peri-implantitis. Peri-implantitis is an infection that can cause bone loss and implants to fall out and must be treated with an intense regimen of antibiotics and deep cleaning. Whiten Teeth: A yellow smile is not an attractive smile. Tobacco stains on teeth are often difficult to remove because they have occurred over years of smoking. Professional tooth whitening by your dentist produces the fastest and whitest results. Screen for Oral Cancer: Smoking greatly increases your chances of having oral cancer. The goal of oral cancer screening is to identify mouth cancer early, when there is a greater chance for a cure. That’s why it’s very important to have a dentist regularly screen for oral cancer. Dental problems from smoking include a yellow smile, tooth loss, gum disease, bone loss, and oral cancer.